When I landed in Hong Kong a few days before the VIP opening of Art Basel HK, I could feel this year will be special. 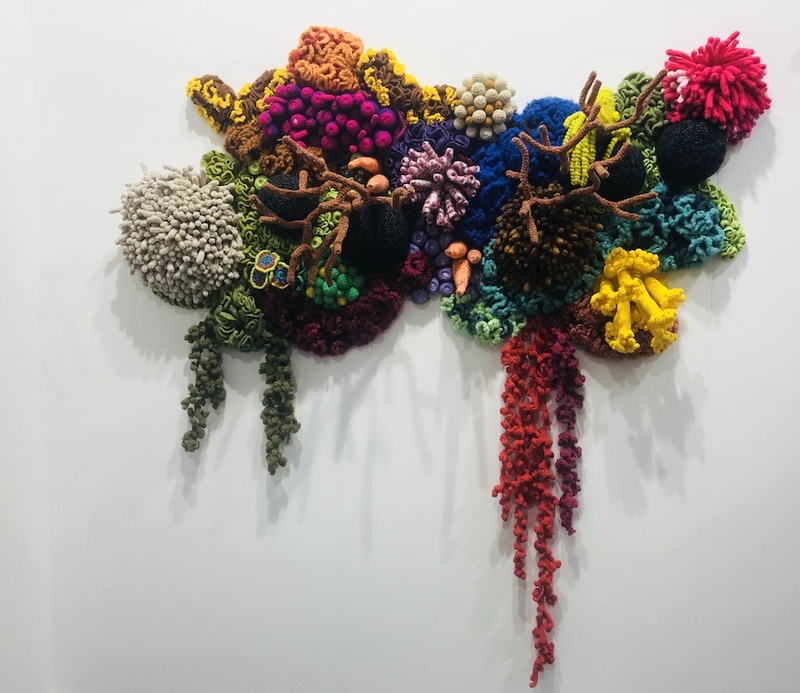 I have been attending all Art Basel fairs in Hong Kong, but there was definitely a buzz and an excitement in the air this year with 248 premier galleries from 32 countries exhibiting. Many collectors had started their Asia marathon attending the Galleries weekend in Beijing and then visiting Shanghai’s new museums before arriving in Hong Kong to start the week. Art Central, the satellite fair of Basel, opened on the Monday afternoon. It offered a pleasant layout and an international mix of galleries with a range of works appealing to both new and established collectors. Art porters from Singapore had a playful installation of Mulyana: “a man who knits”. The Bandung-educated, Yogyakarta-based artist has been creating knitted underwater-themed installations. Each piece is the home to an octopus-shaped monster that has become his alter ego, called Mogus. He works with the local community, housewives and transgender people, and has empowered them with practical skills to make a living. I liked the Swedish artist Herman Lohe at Fiumano Clase and his large canvas of evanescent but emotional landscape. I followed the flow of gallery-goers for the galleries night. 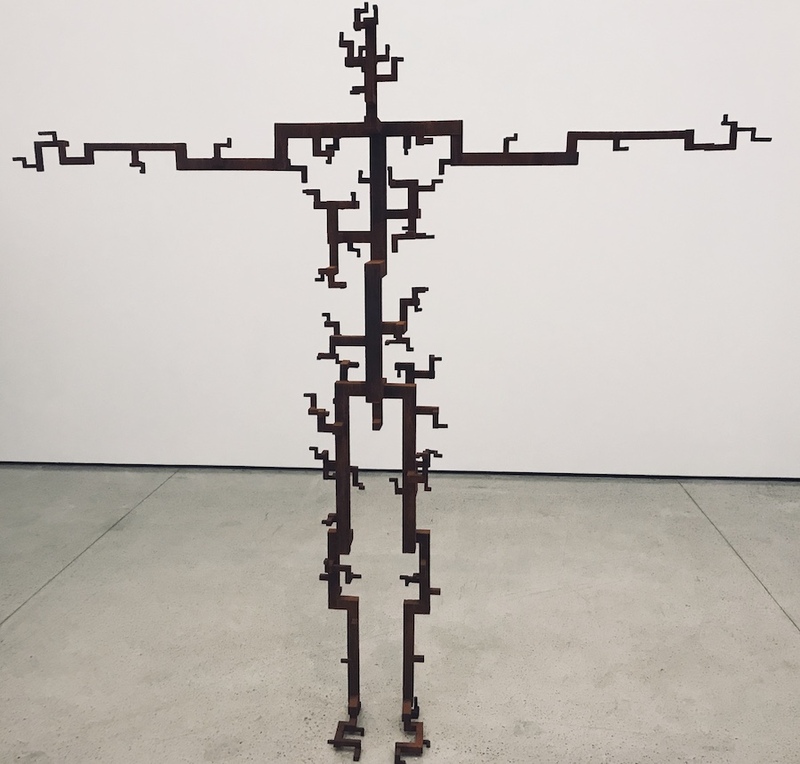 At White Cube, Antony Gormley’s new exhibition was simply mind-blowing – definitely my favourite gallery show. Then further up in Central, the highlight of the evening was the new galleries building HQ with the opening of the new spaces in Hong Kong of mega-dealers: David Zwirner with Wolfgang Tillmans, Hauser and Wirth presenting Mark Bradford, Pace with Yoshitomo Nara. Pearl Lam opened a new space in HQ with a stunning exhibition by Arcangelo Sassolino. The Italian artist presented a poetic large-scale, wall-mounted concrete sculpture made of industrial material. 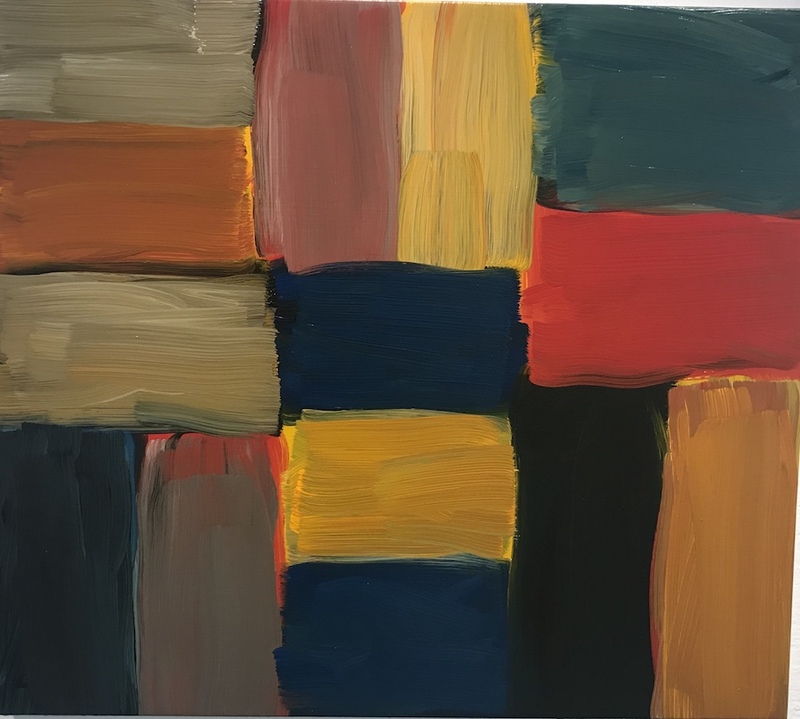 I loved the Sean Scully exhibition “Standing on the Edge of the World” at the Hong Kong Art centre: an investigation in form, colours and architecture by the Irish-born artist. I spent the following days at Art Basel Hong Kong with Mazzoleni gallery, which presented post-war and contemporary Italian artists: Fontana, Burri and also de Chirico. Fausto Melotti, the synesthetic artist who translated music into sculpture, attracted much interest. Overall, I was impressed by the flow of Asian collectors, from mainland Chinese and Koreans to Japanese and South East Asians. They were curious and eager to learn, and in the process growing in confidence and importance. With one new billionaire in China every three days, the level of wealth was palpable at the fair and at the auctions. 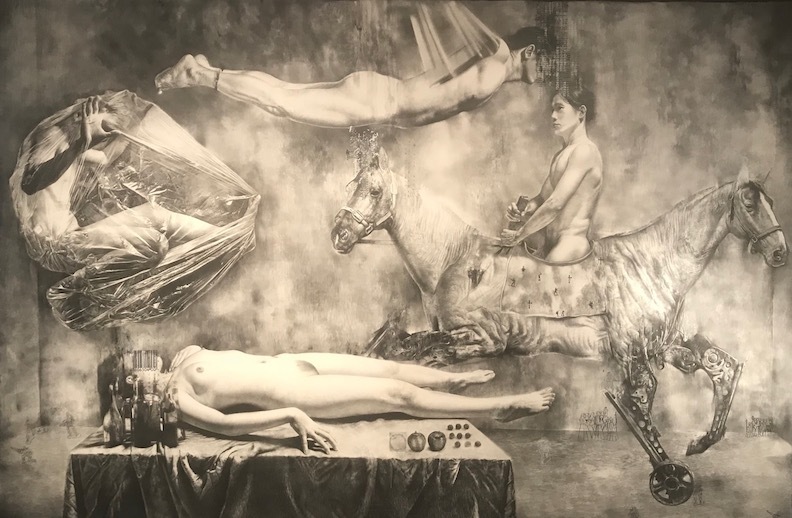 After a very intense week of art and parties, in particular, White Cube and David Zwirner’s lavish parties at the newly reopened Murray Hotel, I ended at the Duddle art dinner organised by “Behind” where the work of Michael Zavros was presented. Going to Jakarta after Hong Kong was a nice break on my way back to London. The Indonesia art scene is vibrant, with Bandung, Yogyakarta and Jakarta as the main art hubs. However, the “public art infrastructure” is lacking in Indonesia. Instead, collectors and Art patrons are leading the way by creating private art Museums. The most well-known Indonesian collector, Dr Oei Hong Djien, possesses the world’s largest art collection of Modern and Contemporary Indonesian art that he houses in OHD Museum, a private museum in Magelang, Central Java. There are several projects of private art Museums to be opened in the coming years. The most recent one from collector Haryanto Adikoesoemo, Macan dedicated to international art, opened in Jakarta end of 2017. It demonstrates the growing appetite for Art. For its first exhibition, it attracted 130,000 visitors. I visited the Museum and met its Director Aaron Seeto who explained that not only does the Museum have a permanent collection of 800 works, but it is working on temporary exhibitions as well. The Museum is also developing a strong educational program for schools and professors. The next exhibition which will open on the 12th of May is dedicated to Yayoi Kusama. It is a partnership with the National Gallery of Singapore, Queensland Art Gallery, and the Gallery of Modern Art, Brisbane, and will present 130 works from the Japanese artist. I ventured to the Akili Museum, an intimate space which presents Rudy Akili‘s collection of mostly south-east Asian artists and in particular Eko Nugroho, Entang Wiharso, Christine Ay Tjoe from Indonesia and Ronald Ventura from the Philippines. A major highlight of my Jakarta trip was to visit Doctor Melanie Setiawan’s archives. For the past 40 years “Ibu Mel” as she is respectfully called, has collected over 75,000 photographs of Art events, studio visits, exhibitions, openings, in Indonesia. This incredible collection of pictures is due to be published in a book and has already been partly exhibited. Doctor Melanie is the memory of the Indonesian art scene, the supporter, godmother of many artists that she has been nurturing and guiding. Ibu Mel’s passion is tireless, and she is constantly travelling to support Indonesian artists. In fact, she was packing for her trip to Art Cologne and Art Brussels when I visited her in Jakarta. I left Asia after two weeks, pleased by all my art encounters and truly convinced that the future of art in the east will be bright.